She was named “Witje”, Whitey, at birth because her fur was pure white. During her final year, the color went slowly out of her black face-mask. She survived a mysterious illness of which her sister died almost two years ago. She remained fragile after that ordeal. But very cute and adorable still. She would sleep in my lap in the evening when I was working on your packages, she would eat her morning food on the kitchen counter next to me while I would be preparing my work lunch; she has wanted to be near us all the time. She was a “people” cat until the end. She loved us and we loved her back. Last week she stopped eating, and three days ago she would no longer drink. She was a strong girl, that she managed to hold on to life for so long. She slowly faded from consciousness to deep sleep until she would no longer respond to our voices and we knew the end was not far off. But while she was awake and still able to walk she wanted to stay with us, never tried to find a quiet spot and wait for the end like her sister. We let her sleep inbetween us during her final two nights, and now she’s gone and leaves an empty space in this household. Posted: 10 May, 2015 in Me. So long Witje, sweet package’s Fairy. Sorry for your loss, Eric. She’s at better place now.. I am so sorry for your loss Eric. 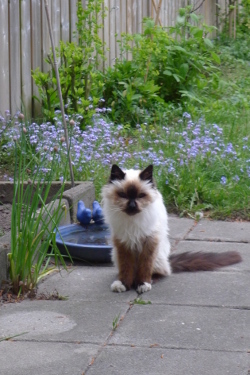 Rest in peace sweet Witje. I hope that the emoticon U+1F63B can go through. Sad day Eric, memories is what we get from precious pets as your cat. I’m sorry for your loss, Eric. We recently lost one of our cats after 15 years of being a family member. Your sorrow is felt through the wonderful words you wrote. Whitey was clearly one of the family and you were attached, as we all become attached to our cats. May she rest in peace. We had to let go of our street cat Rubbish last year, she is sorely missed so your words ring true and we feel your loss. What a beautiful and kind cat. switch off simply, even among animals. counteract the deteriorating effects of low gravity. I am sorry Eric. I thank Witje for the company she gave you all these years. I’m confident she’s in a better place now. Sorry, Eric. May she rest in peace. Sincere condolences, Eric. The only problem with cats is that they never live long enough. Eric, so sorry to hear of your loss. My wife & I have been through it many times with our past feline companions. It is never easy, especially with one who is so attuned to their human caretakers…peace to your family. My condolences, Eric. I’ve buried quite a few cats over the years, and I know how hard it is.